MANILA, Philippines - The October 2017 Psychometrician board exam results including the official list of passers, topnotchers (top 10), top performing schools and performance of schools were released on Tuesday, November 7, 2017 or in four (4) working days after the last day of exam. 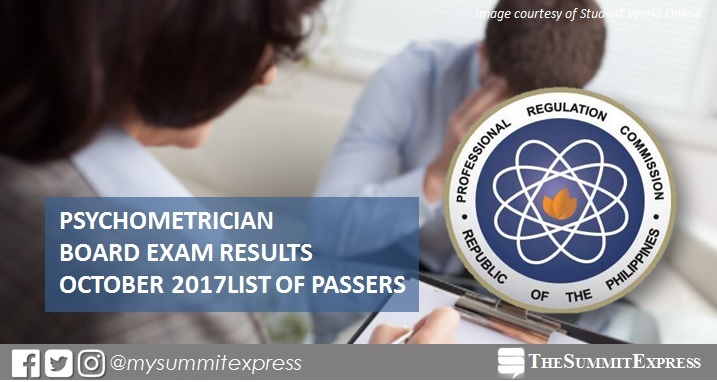 PRC conducted the Psychometrician licensure exam in the cities of Manila, Baguio, Cagayan de Oro, Davao, Iloilo, Legaspi, Lucena, Tuguegarao and Zamboanga on October 29 and 30, 2017. From November 22 to 28, registration for the issuance of Professional Identification Card (ID) and Certificate of Registration will be done on-line. Please go to www.prc.gov.ph and follow instructions for initial registration. Psychometrician board exam's verification of ratings (passers, non-passers and removal) can be done online. The two-day Psychometrician exam covered the following subjects: theories of personality, psychological assessment, abnormal psychology and industrial psychology. According to PRC Resolution No. 2016-1019, the target release of results for the recent Psychometrician board exam is on Tuesday, November 7 or in four (4) working days after the exam. In the August 2016 licensure exam, results were announced online in three (3) working days. 3,690 out of 7,312 successfully passed the Psychometrician exams. Gilana Kim Tan Roxas from the Ateneo de Manila University (ADMU) - QC topped the board with 85.60%. In the July 2015 exams, PRC released results in seven (7) working days. A total of 2,061 out of 4,466 hurdled the tests. Van Alistair Hornillos Faeldon from University of Santo Tomas (UST) led the passers with 84.20%. We advise examinees to monitor announcement of results starting Monday, November 6 or in three (3) working days after the exam. Monitor this page for the real-time updates on Psychometrician board exam results. Check out also the official website of PRC for more information.